tachisme: Tide Out on the Tamar River, "Tamar Mud"
A Tasmanian landscape painting from Launceston, this work is a celebration of the Tamar’s mud, inexorable, ambiguous, eye-sore, engineering conundrum, despoiler of moorings, shipping hazard, tourism turn-off, flood risk; yet also home of gastropods, wetland bird platform, hydrodynamic marvel, shifting installation, thing of beauty. As much as Launceston hates it, the mud is integral to the city. The CBD is visible from its glistening flats. Effluvia of the Cataract Gorge, it is the child and rememberancer of the ‘untamed’, come to tame the heart of urban commerce. Whether we keep watch, or whether we sleep, it settles and silently goes about its business - the business of challenging our certainties and unsettling our imaginations. 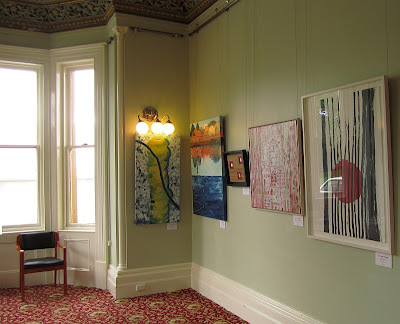 I entered this painting in the 2011 Tasmanian Art Award, 9 April to 17 April, where it hung by a bay window in the wonderful old "Eskleigh" manor, named after the Esk River that flows down to the Launceston Cataract Gorge). This 'post-modern' work is banded into three zones. The upper formalist zone references the structure of, and human control inherent in, city buildings, levies and parks; a middle transition zone (between city and nature ) of fractured reflections; and a lower zone of free flowing marks where the image, like a projective Rorschach, emerges from the plasticity of the medium itself to signify mud - deep and dark as the Unconscious and all those primal forces that ooze and sweep down the Cataract Gorge. It didn't sell at the Tasmanian Art Award exhibition and is now back home in my studio. Try and place it with a gallery? Just let it gather dust until one day i have a landscape exhibition? Well, it can hang about for a while (big and cumbersome as it is) as a learning exercise. Thank you, Laura. Yes, our river can have quite a dreamy mood at times. Haha, thanks, Kathryn & Gemma. I hate schlepping around galleries - what a waste of life. Maybe i need an agent, lol. Have a little more faith; its owner hasn't seen it yet. Harry, Brilliant composition and narrative. I agree with comments on finding another venue. The spot on the wall for the first showing was underwhelming...this piece deserves much more space. A concept worthy of a series (?). And even if this is the only painting on this idea...given time to develop...face to the wall...back in a corner...a wonderful surprise a year from now when you're searching for worthy pieces. I will also advise you to be patient Harry. It is a lovely work. What a wonderfully positive way to be looking at it, Hallie. The painting has its flaws but it it isn't too bad either. These things are so much a matter of taste. I'm sure there is a buyer out there. But i find 'marketing' my work quite soul-destroying, as i suspect quite a few artists do. I don't know that i can even be bothered. Sound advice, Candace. I think this will be the only one in this style. 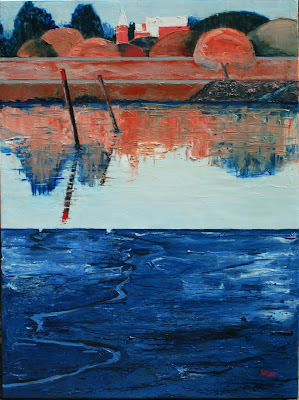 Next large oil landscape will be more absrtact, more expressionist. But yes, i have turned it face to wall to bide its time, as you suggest. And fair point about how the work was hung. But my other work, "Wild Waters", was given a great uncrowded spot where it could be viewed properly from a distance. Win some, lose some. Thanks, AK. I know youre right. I appreciate your support. Harry, mud never looked so good! What an amazing painting, going well beyond merely depicting a scene, it is the thing itself, it shimmers and sings some kind of muddy song emerging from the depths of the river's throat. I'm sure wherever this wonderful piece is meant to end up it will eventually make its way there. Keep the faith, my friend. I agree with Candace. There is a series in this piece. I agree with Hallie also. Your audience has not seen it yet. Harry, you tell the truth. Truth is never as fashionable as a pretty picture. But a pretty picture without something to say is empty. There is something important about this piece so save it and maybe it will lead to something more. I have pieces that I never show but I keep them because of that important something. So turn it to the wall for a while and it will tell you where it should go later. Thanks for your faith and wise words of counsel, Davida. I've brought it into the house and suddenly it is very intense. Too overwhelming to live in the small rooms. I think it will have to live down in the garage til whenever. Faith in yourself . If you didn't sell doesn't means much , probably no money around or no taste ah!ah! I loved it , keep it , hanged in your home!!! !There are very few satisfactions for us , but we have to believe in our work , when we are able to provoke emotions and feelings. Marialuisa, you're a real tonic! And you are absolutely right!